The Centralia Amtrak is a 14-minute drive from this Washington hotel. 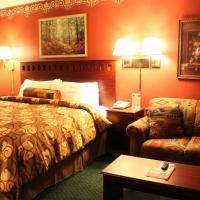 Chehalis Inn features an outdoor pool and offers cable TV with HBO in every room. Free Wi-Fi and a work desk are included in the warmly decorated rooms. Most rooms are also equipped with a microwave, fridge and coffee maker. Guests can enjoy a daily continental breakfast that includes waffles, muffins and biscuits and gravy during their stay. Vending machines with snacks and drinks are available. Veteran's Memorial Museum and Centralia College are within a 12-minute drive of Chehalis Inn. Stan Hedwall Park is a 13-minute walk away. Nestled off Highway 5 between Mount St. Helens and Mount Rainier, this Chehalis, Washington hotel offers comfortable rooms with free Wi-Fi and serves a daily continental breakfast. Veterans Memorial Museum is 2 miles away. A 25-inch cable TV, a microwave, a refrigerator and a work desk are included in all guest rooms at Relax Inn. Select rooms at this pet-friendly hotel offer spa baths and balconies with mountain views. All rooms are climate controlled. Chehalis-Centralia Railroad, which offers a steam train ride though the countryside, is 7 minutes away from Relax Inn Chehalis. Rainbow Falls State Park is 18 miles away.